VSI reported that during 16-23 April seismic activity increased at Inielika in comparison to the previous week. Seismographs recorded five deep volcanic, ten shallow volcanic, and eleven tectonic earthquakes. Inielika is at Alert Level 2 (on a scale of 1-4). The previous report of significant volcanic activity occurred on 11 January 2001 when minor explosions began. Since the decline in eruptive activity that occurred during 23 January-5 February 2001 (BGVN 26:01), variable seismicity has prevailed. Ash plumes were observed in February and March reaching 10-500 m above the volcano. The Volcanological Survey of Indonesia (VSI) reported varying amounts of seismicity (table 1). VSI has not reported new eruptive activity at Inielika since May 2001. Table 1. Seismic activity detected at Inielika during February through May 2001. Courtesy of VSI. During 6-11 February, Inielika volcano remained active and the VSI reported no significant change in volcanic activity. An ash plume was observed rising 25-500 m above the volcano and there was a slight increase in the number of deep volcanic earthquakes in comparison to the previous week. The Alert Level at the volcano was reduced from 3 to 2 (on a scale of 1-4). The VSI reported that during 23-29 January no explosive activity occurred, but a plume of white ash rose 100-500 m above the crater. The volcano remained at Alert Level 3 (on a scale of 1-4). The VSI reported that during 16-22 January ongoing explosions sent ash 100-1,000 m above the crater rim. Ash was deposited within a 10-20 m radius around the crater; lapilli with a maximum diameter of 50 cm were deposited out to ~500 m around the crater. Observations on 21 January revealed that two new large craters formed, to the SE and the NW. The SE crater was 50 m in diameter and 10 m deep. The NW crater was 20 m in diameter, open to the NW, and 1.1 m deep. The volcano remained at Alert Level 3 (on a scale of 1-4). A minor explosion on 11 January 2001 at 1915 produced an ashfall deposit less than 0.5 mm thick in Bajawa (~8 km from the source). On 13 January 2001 at 0700 three explosions occurred, sending a plume ~300-1,000 m above the crater rim; it moved eastward towards Toa village and southward towards Boya village, Bajawa, and Bolodio city. Thundering sounds were heard from the observatory (~7.5 km from the summit). Continuous tremor was recorded with an amplitude of 2 mm and 59 explosion earthquake events had been registered as of 15 January. Inielika is at Alert Level 3 (on a scale of 1-4). A minor explosion occurred at 1915 on 11 January 2001. The explosion ejected ash that coated Bajawa (~8 km from the summit) with an ash layer less than 0.5 mm thick. Increased activity after 11 January prompted the VSI to set the volcano's hazard status to 3 (on a scale of 1-4). Three explosions occurred at about 0700 on 13 January, sending ash 300-1,000 m above the crater rim. Workers at the volcano's observatory post, located ~7.5 km from the summit, subsequently heard thundering sounds. Ash, which appeared dense and light in color, blew E to Toa and S to Boya, Bolodio, and Bajawa. By 15 January, a seismograph recorded continuous tremor with an amplitude of 2 mm in addition to 59 explosion earthquakes with amplitudes of 2-14 mm. Ash emission was ongoing as of 16 January, and ranged from 100 to 1,000 m above the summit. VSI workers observed two new large craters trending SE-NW. The top of the SE crater measured 50 m in diameter, narrowed to 25 m at its base, and was 10 m deep. It emitted an audible sound and ejected an ash plume from its N wall with variable pressure. Winds tended to blow ash toward the S. The NW crater was 20 m in diameter and 1.1 m deep. The temperature of a fumarole measured 95°C, and nearby ground temperature measured 89°C. During 16-22 January, explosions produced both ash and lapilli. Light gray ash fell around the main crater within a 10-20 m radius. Lapilli, which had a maximum size of 50 cm, fell up to 500 m from the main crater. The following report covers Inielika's activity during 23 January-5 February 2001. The VSI issued three photographs showing Inielika's summit area (figures 1-3). No explosions occurred during 23-29 January, unlike earlier in the month (BGVN 25:12). Instead, a white gas-and-steam plume rose 100-500 m above the summit. Volcanic earthquakes, tectonic earthquakes, and continuous tremor with amplitudes varying from 0.3 to 1.2 mm occurred. Figure 1. A gas-and-steam plume exiting from one of Inielika's craters on 11 January 2001. Courtesy of VSI. Figure 2. View of Inielika's summit crater lakes as seen on 11 January 2001. The lake in the center foreground is green, and the lake behind and to the left of it is a dark color. A light-colored plume issues from a vent on the right side of the image. Which of the volcano's ten craters these represent remains uncertain. Courtesy of VSI. Figure 3. A recently formed vent (arrow) seen in a crater on Inielika's summit on 11 January 2001. Courtesy of VSI. Activity remained relatively similar during the following week of 30 January-5 February. A gas-and-steam plume rose 25-500 m above the summit. The number of deep volcanic (A-type) earthquakes increased with respect to the previous week, and tremor was no longer continuous. The VSI maintained Inielika's hazard status at Level 3 (on a scale of 1-4) as of 5 February. Inielika is a broad, low volcano in central Flores Island that was constructed within the Lobobutu caldera. The complex summit of the 1559-m-high volcano contains ten craters, some of which are lake filled, in a 5-sq-km area north of the city of Bajawa. The largest of these, Wolo Runu and Wolo Lega North, are 750 m wide. The first historical eruption of Inielika, a phreatic explosion that formed a new crater, did not occur until 1905 and was the volcano's only eruption during the 20th century. Another eruption took place about a century later, in 2001. A chain of Pleistocene cinder cones, the Bajawa cinder cone complex, extends southward to Inierie. Muraoka H, Yasukawa K, Urai M, Takahashi M, Nasution A, Takashima I, 2002. 2001 fissure-forming eruption of Inie Lika volcano, central Flores, Indonesia. Bull Geol Surv Japan, 53: 175-182. Sucipta I G B E, Takashima I, Muraoka H, 2006. Morphometric age and petrological characteristics of volcanic rocks from the Bajawa cinder cone complex, Flores, Indonesia. J Mineral Petr Sci, 101: 48-68. There is no Deformation History data available for Inielika. There is no Emissions History data available for Inielika. This view from the east shows the N-S-trending crater complex of Inielika volcano. At the extreme left is Wolo Lega crater, and the 1905 crater is located just right of center. The high point at the center of the photo is Wawolika cone. The Inielika chain of craters stretches across the Bajawa Highlands in this view from the NE. On the extreme left horizon is Wolo Runu, along the center horizon are the lake-filled Wolo Lega craters with the flat-topped cones of Wolo Itakai and Wolo Ata behind them. On the right horizon is Lobobutu cone. Other craters occupy the foreground. The sharp-topped peak at left center is Gunung Inierie volcano, the highest on the island of Flores. 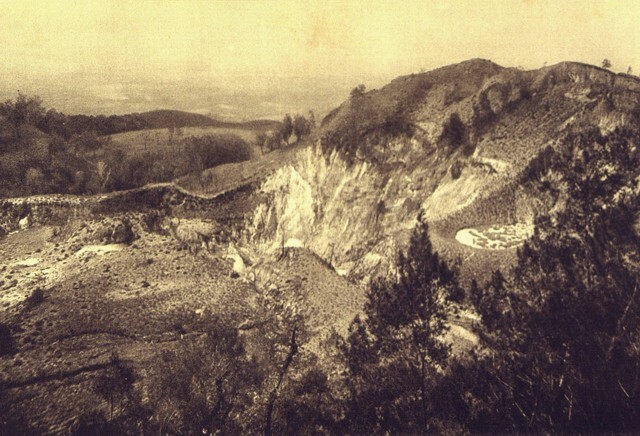 A brief phreatic eruption in November 1905 lasting only 5 hours formed this crater at Inielika volcano. The 125-m-wide crater cut the floor of Wolo Inielika crater, one of many craters along a N-S-trending ridge at Inielika volcano. This marked the only historical eruption at Inielika. A N-S-trending chain of cones and craters in the Bajawa Highlands forms the summit of Inielika volcano, seen here from the east. Ten craters, some of which contain crater lakes, dot the complex summit region, and others occupy the flanks of the volcano. Most slopes of the volcano, like other areas in the Bajawa Highlands, are covered by needle-like alang-alang grass. The only known historical eruption from Inielika was a phreatic explosion in 1905 that formed a new crater. Photo by Ruska Hadian, 1970 (Volcanological Survey of Indonesia). Two of the many summit craters of Inielika volcano can be seen in the left foreground. 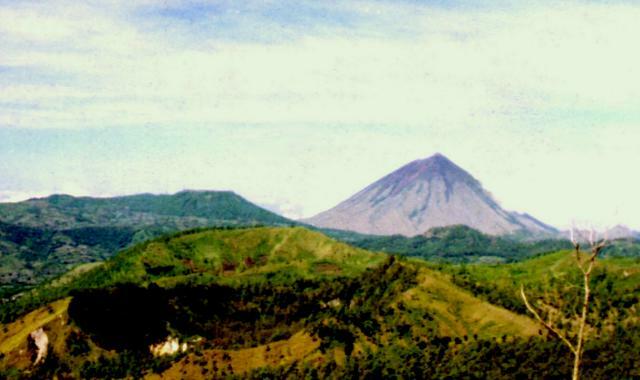 Inielika is a broad, low volcano in central Flores Island that was constructed within the Lobobutu caldera. The complex summit of the 1559-m-high volcano contains ten craters, some of which are lake filled. The first historical eruption of Inielika, a phreatic explosion that formed a new crater, did not occur until 1905 and was the volcano's only eruption during the 20th century. Sharp-topped Inierie volcano is the prominent peak on the right horizon. There are no samples for Inielika in the Smithsonian's NMNH Department of Mineral Sciences Rock and Ore collection. Large Eruptions of Inielika Information about large Quaternary eruptions (VEI >= 4) is cataloged in the Large Magnitude Explosive Volcanic Eruptions (LaMEVE) database of the Volcano Global Risk Identification and Analysis Project (VOGRIPA).